I’m on a lot of conference calls requiring an extension to be dialed. Since I’m often in the car or walking while talking, I need a quick way to enter the extension and the “#” button. 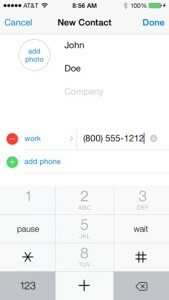 There’s a nice tool for Apple iPhones and Android phones to help speed the dialing. The phones understand the format of the 800 number, but they do no know to dial the extension (meeting code). iPhones give you two options. One is a pause, shown as a comma in the number, and the other is a wait, shown as a semi-colon. Why the difference? 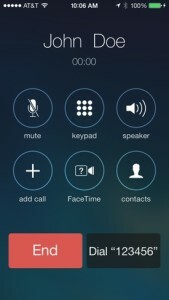 If you know how long to wait before automatically dialing the extension, then you can use the “pause”. It’ll dial the extension for you. If you do not know how long to wait or would like to manually initiate the extension autodial, then use the “wait”. You can use these formats in meeting invites, too. The phone will pick up the formatting and dial according to the comma or semi-colon. Next, press the “+*#” button in the lower left. You’ll see the keypad change and have new options. Next, press the “wait” or “pause” button. My example uses the “wait” button. Then add the extension or meeting code. Then, click Done and you’ll see a screen like this. 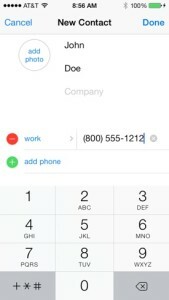 When you press the phone number in the contact, the phone will dial the number and show you a new option in the lower right. 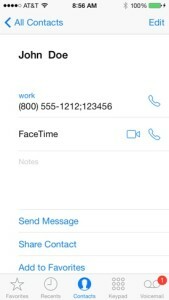 Once the phone call is answered by the automated system and it’s time to dial the extension, just press the button in the lower right. That’s all there is to it. Now, you can set up your contacts and meetings with this time saving format. Want to do it on Android? All you need to do is choose the comma. There’s no “wait” in Android. What’s Going On in 2010 With Technology?